On a recent project we were tasked with trying to reduce the peak electric demand of a building that already had a relatively low summer peak demand of around 40-45 kW and even lower winter demand of around 25 kW. Immediately ideas jumped into our head that we should look at the four installed rooftop units and the commercial kitchen equipment as sources for peak electric demand savings. Before we began any analysis though, we metered the feed of nearly every electrical distribution panel in the building to check for any anomalies. We found what was expected – the kitchen and RTUs accounted for a large amount of the electrical demand. However, when we compared this data with the utility meter (total power of the building) data for the same time period we found that one feed we did not meter turned out to be an important one. That important feed we did not meter was the elevator feed, which we assumed was an unavoidable peak contributor because the elevator is required to operate if needed in this facility. We also assumed that since the elevator was rarely used it would be a small contributor to peak demand since the entire operation takes 30 seconds or less when needed in this three story facility. 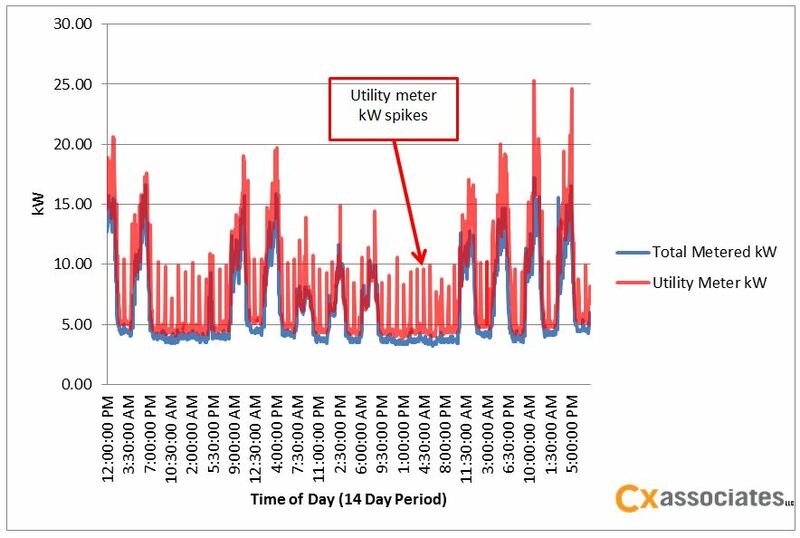 Normally these types of operations have a small impact on utility meter demand because the utility meter records an average kW every 15 minutes. The utility meter, however, showed consistent spikes that were not captured in our meter data as can be seen in the image below. Since the only major piece of equipment that was not metered was the elevator we decided to go back and meter the elevator alone. 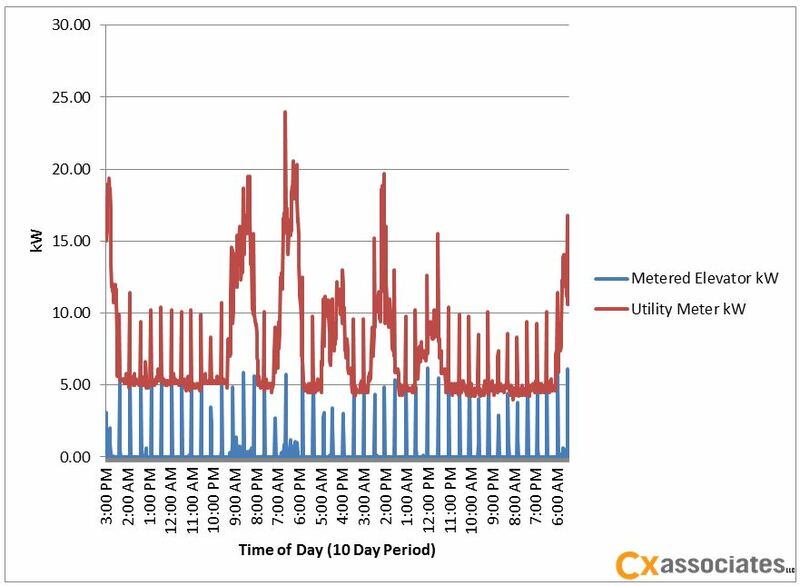 The graph below shows the Utility meter kW vs the Metered Elevator kW. As you can see, the elevator was clearly the culprit of the spikes. I was unsure why this was until I did some research on elevators and found out how little I knew about them to begin with. 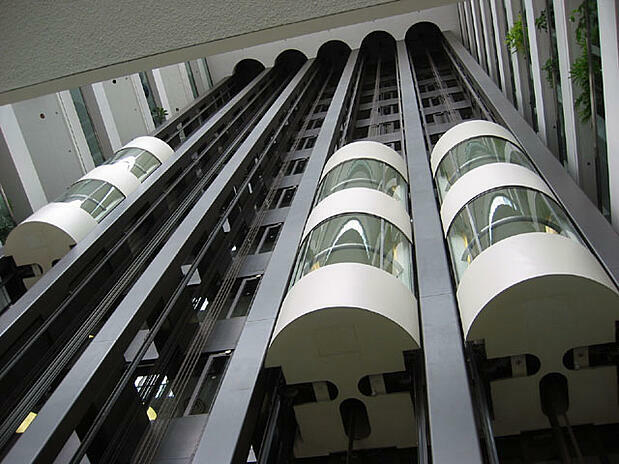 This particular elevator is a hydraulic elevator and requires a machine room that houses a hydraulic fluid tank. The fluid in this tank is required to be within a certain temperature range to make the elevator operate properly. During these meter periods, the fluid had to be heated in order to remain inside this temperature range, and this heating process was causing the spikes. After checking with the manufacturer I found that the fluid heating process for this elevator was to run the elevator pump and cycle the fluid through the pump for a period of time until the friction of the pump heated the fluid to a predetermined setpoint. The manufacturer also told me that this process was common for most hydraulic elevators. I came to the conclusion that it was so noticeable at this facility because this elevator is rarely used. The oil normally can maintain temperature from normal use in a facility where elevators are used commonly and the pump is working normally. Since this elevator was rarely used it was not maintaining temperature through normal operation. A simple solution to reduce the peak demand and prevent the elevator from using the pumping process to heat the fluid is to install a simple 275 watt electric hydraulic fluid heater accessory from the manufacturer. This should reduce the peak draw from approximately 5kW to 0.275kW. The moral of this story is to keep an open mind and don’t just look at the typical “low hanging fruit” when looking for energy savings in a small commercial building.